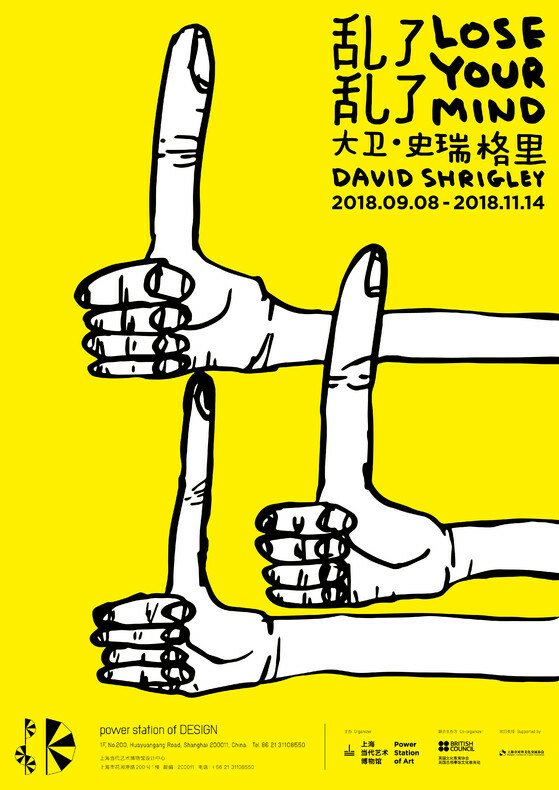 From September 8 to November 14, 2018, power station of Design, a creative extension of the Power Station of Art, and British Council are pleased to present the premiere solo exhibition of British artist David Shrigley. Entitled Lose Your Mind, the exhibition showcases more than 400 pieces of Untitled Drawings, a 1:1 scale inflatable version of Really Good, and other signature works over the past 30 years representative of Shrigley’s irreverent take on the intersections between art, design and popular culture. The exhibition hopes to shake up our assumptions by breaking down existing understandings of contemporary art. 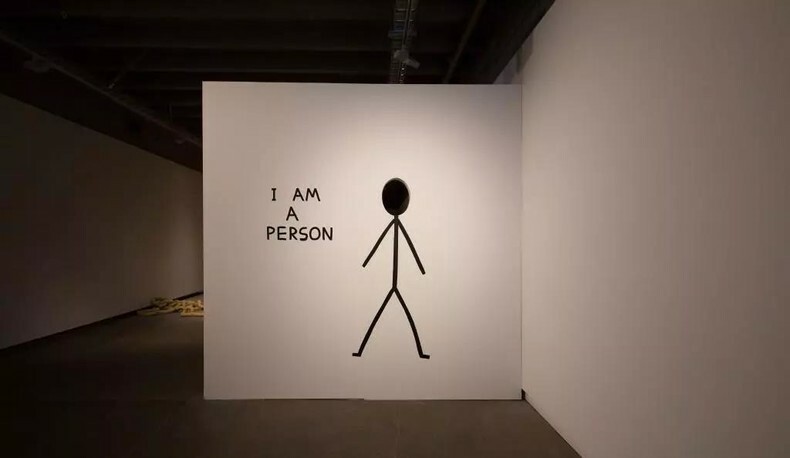 Shrigley is known for his clever use of puns, satirical play-on-words, to present his unique black humour and absurd surrealist depictions of everyday situations. What is behind the seeming cynicism is the artist's insight into the human condition and his criticism of the ‘cliché’. The artist sets up multiple rousing hurdles for the upcoming exhibition. 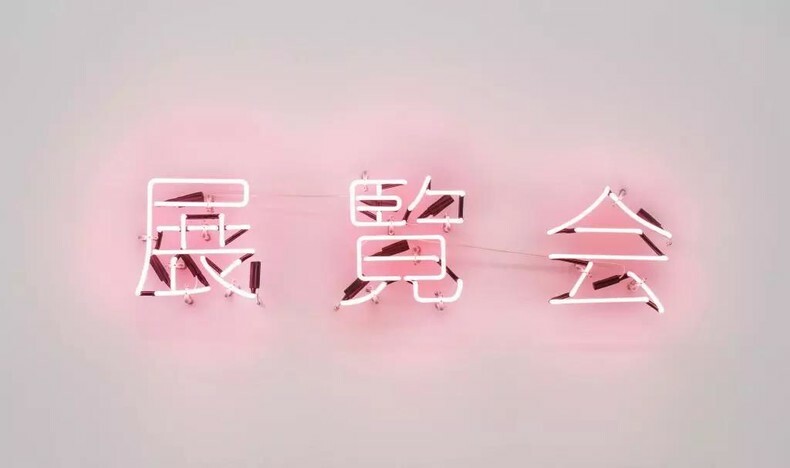 Audiences must enter through a “Death Gate” and a“展覧会” neon sign that is deliberately mis-spelled; adjacent to a wall installation exclaiming "I Am A Person". There are also other playful, misleading signage such as a "No Photograph" sign and an actual photograph which tells the viewer to "Imagine the Green is Red". Even remaining vigilant, it will seem, as the exhibition title indicates, you will have inevitably, “lost” your mind. Perhaps this is the purpose of the exhibition: to allow people to empty the contents of their brain and get enlightened and replenished by the likeness of chaos. David Shrigley has remained very interested in and passionate about art since he was young. He once said, “Drawing was fun when I was at infant school, and it’s fun now.” He regards creating as a spontaneous and natural process and uses art to record the mundane banality found in daily life. 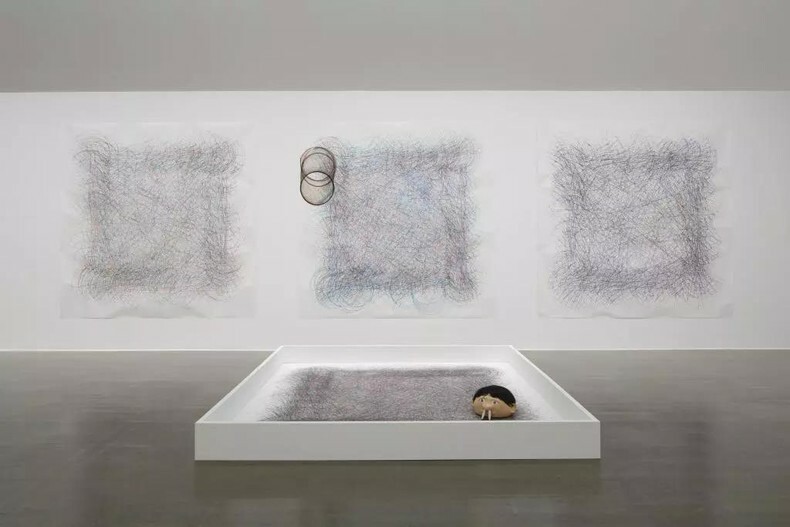 The exhibition showcases over400 pieces of Untitled Drawings, which is an ongoing work he created from 2004 to 2014. The black and white wiggling lines recognise how skilfully the artist deals with the subtle relationships between graphic and text, allowing for a simple self-expressiveness in his drawings, avoiding use of any lofty language and excessive explanation. 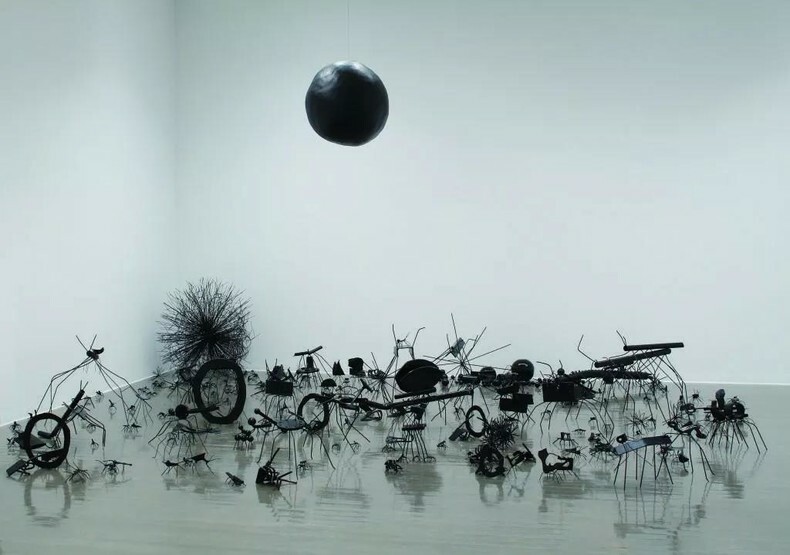 The artist also avails himself in creating installations which reconstruct a new world. Insects comprise of approximately400 insect-like sculptures and form a micro-universe that has sprung from the artist’s imagination. This work uses both space and objects within space as away to intervene within our collective imagination. In 2016, his 7-metre-high bronze sculpture Really Good showing an elongated ‘thumb’s up,’ was selected for one of the most important public art commissions in the UK, the Fourth Plinth in London’s Trafalgar Square. The sculpture drew significant attention and made people to rethink the dichotomies found within daily life. A 1:1 scale inflatable version of Really Good is specially commissioned for this exhibition. 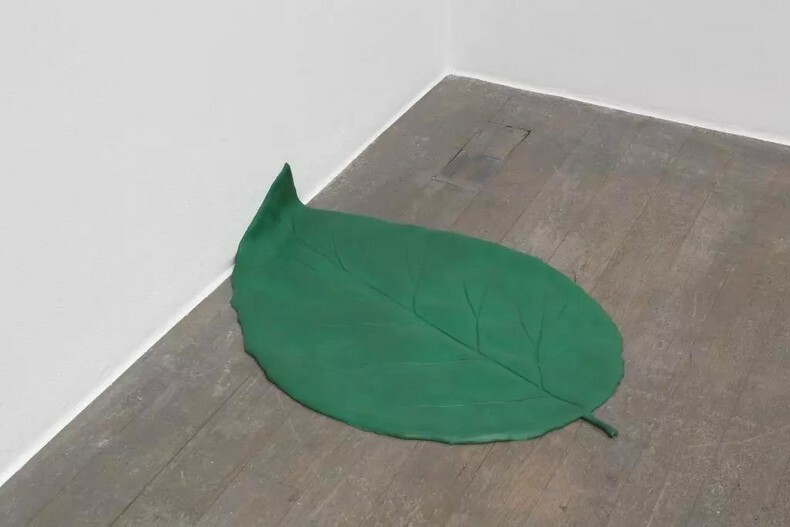 With this reproduction, realised as a cartoon-like balloon sculpture, the artist invites us to consider things we deem to be ‘really bad’ and seeks to turn them into something positive. 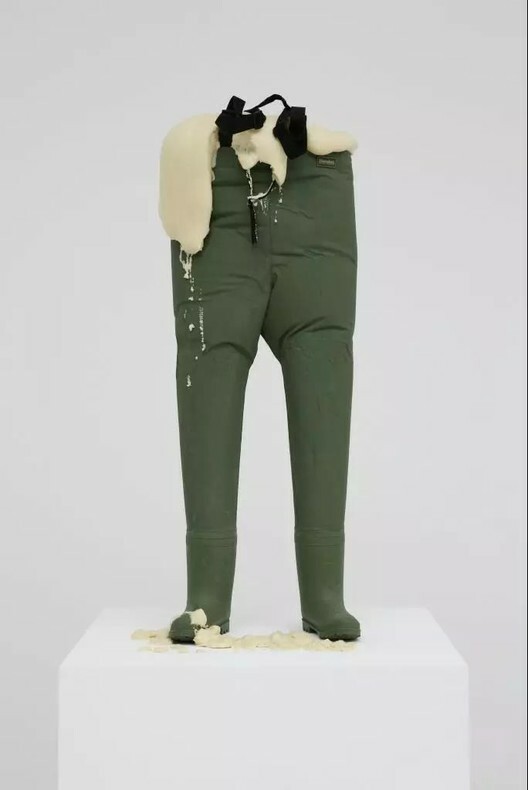 Shrigley queries the existing definition of contemporary art, and constantly challenges the traditional boundaries of art-making through his everyday creative practice. His work Boots explores the boundaries between art and craft; with the mode of display equally evoking the atmosphere of a retail store and the presentation of artefacts or fine artworks within a natural history museum. Spectre exhibits an empty pedestal and 300 drawings by a wide range of people; including children, adults, amateurs and professionals. By doing so, the installation re-examines authenticity and imitation in an artwork. Circling on the canvas itself, The Artist is a robot creating marks with colourful pens inserted in his nostrils. It explores the act of automation within a mechanical age. 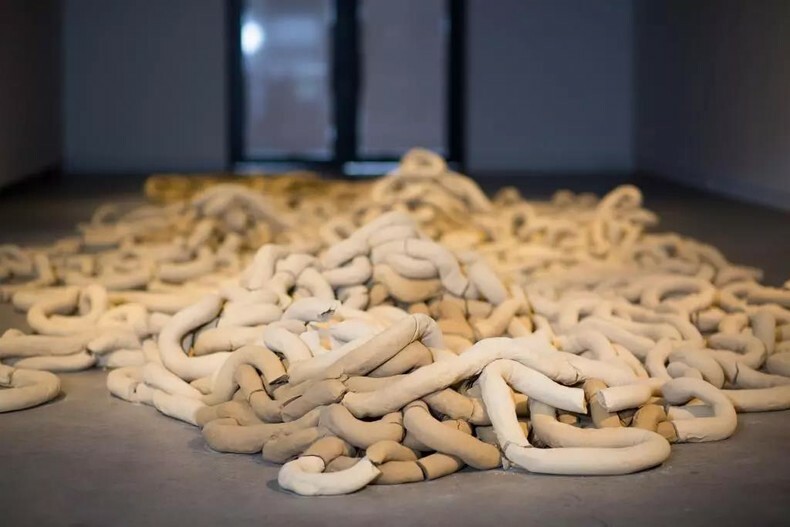 In the preparatory stage of this exhibition, David Shrigley will work with local volunteers to complete a two-ton clay work called Beginning, Middle and End. Shrigley has said ‘maybe it’s a metaphor for life: a very short beginning, a very short end, and a huge middle bit where lots of stuff seems to be happening’.It is the artist’s clear hope that the construction of this work will question the relationship between objects found in a traditional museum and the finished artwork which is completed by audiences themselves.This process of communal making is akin to other projects in which Shrigley cleverly contradicts or irreverently pokes fun at the concept of what it means to be ‘an artist’. David Shrigley straddles the spheres of art and design with ease. He has published many artist books and his drawings are regularly reproduced as T-shirts, badges and are extremely popular internationally. With his first solo show in China, Shrigley will collaborate with psD on a series of original design products. 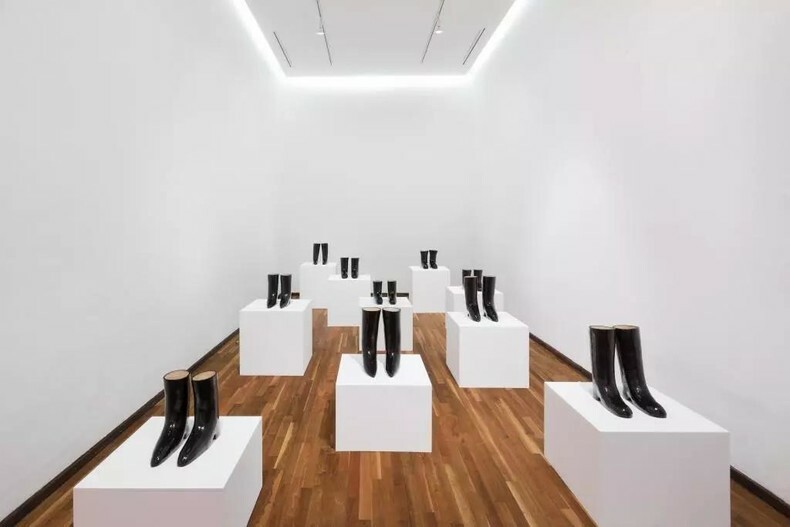 The jointly developed garment collection between Shrigley and the designer brand “Boundless” will also be displayed in the newly furbished metal boxes of psD along the Huangpu River and also sold at the Power Store. This exhibition is also supported by Shanghai International Culture Association. David Shrigley was born in Macclesfield in the north of England in 1968. He studied at the Glasgow School of Art and now lives Brighton in southeast England. In 2003 he animated the music video for ‘Good Song’ by Blur. Between 2005 and 2009 he produced a weekly cartoon for The Guardian newspaper. In 2013 he was shortlisted for the Turner Prize. 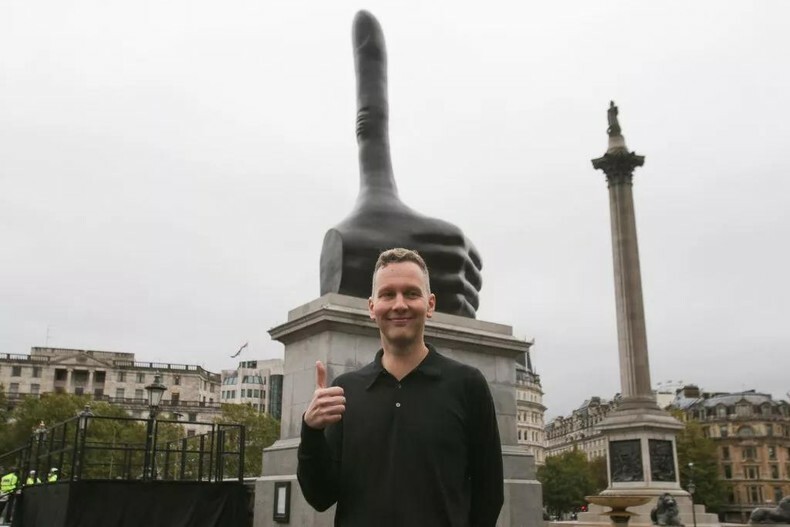 In 2016, his ten metre tall bronze sculpture Really Good showing an elongated ‘thumb’s up,’ was selected for one of the most important public art commissions in the UK - the ‘fourth plinth’ in Trafalgar Square. Shrigley is best known for his drawings, which make witty observations about situations in everyday life. 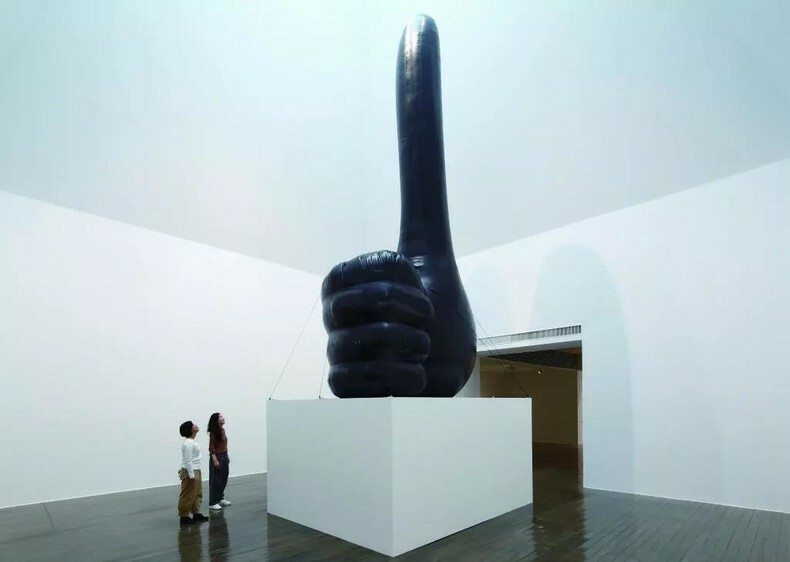 David Shrigley held shows in many places, including the solo show in Melbourne’s National Gallery of Victoria (2014-2015), Drawing in Munich’s Pinakothek der Moderne (2014), Brain Activity in Hayward Gallery (2012), Yerba Buena Centre for the Arts (2012), Kelvingrove Art Gallery and Museum (2010) and Glasgow International (2010). The British Council is the UK’s international organisation for cultural relations and educational opportunities. They create friendly knowledge and understanding between the people of the UK and other countries. They do this by making a positive contribution to the UK and the countries we work with – changing lives by creating opportunities, building connections and engendering trust. They work with over 100 countries across the world in the fields of arts and culture, English language, education and civil society. Each year they reach over 20 million people face-to-face and more than 500 million people online, via broadcasts and publications. Founded in 1934, they are a UK charity governed by Royal Charter and a UK public body. Shanghai International Culture Association (SICA) was founded in 1986 as a municipal-level people’s organization that conducts non-governmental international cultural exchanges. Its function is to strengthen mutual understanding and friendly cooperation between Shanghai and the rest of the world. It serves to enhance Shanghai’s economic growth, scientific progress, and cultural output through people to people engagement in international cultural exchange. SICA has a council composed of nearly a hundred local and international public figures. It also has operating departments in charge of exchanges in various fields and an integrated management unit. SICA features a wide range of cultural exchange and communications in multifarious fields including culture and arts, the humanities, social sciences, economics, finance, science and education. It organizes a variety of substantial events, such as art exhibitions, cultural performances, international conferences, academic seminars, and cultural exchanges abroad. SICA combines Chinese and Shanghainese culture, continuing the tradition of international cultural exchange, it further expands the breadth and depth of the cultural exchange between Shanghai and the rest of the world. SICA thereby has greatly contributed to making Shanghai a truly international metropolis.